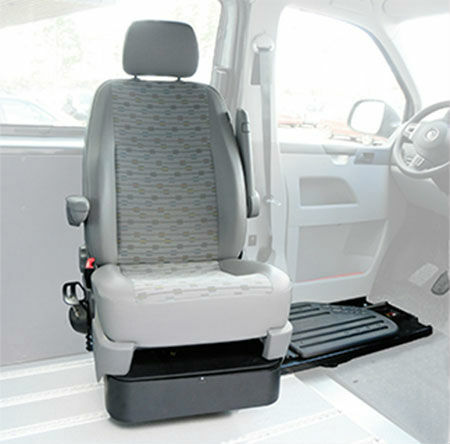 The 6 way power base allows a wheelchair user to gain access to the driver or front passenger positions from the interior of a suitable van. The power base is generally fitted with the vehicles original passenger or drivers seat. The system operates as follows. The chair user transfers to the power base seat which is electrically driven into the row 2 position and rotated up to 140 degrees. Once sitting in the seat, the user can rotate it (electrically) till it faces the front of the vehicle. The seat can then be propelled forward (electrically) until it is in the required position for passenger use or for driving. At any point during this operation it can adjusted for height (electrically) to match the wheelchair seat height or driving height. Returning to the wheelchair is the reverse of this procedure. Assesment of the proprosed vehicle is required as a first step. The Autoadapt 6-Way Base is designed with focus on the safety of the driver. It goes without saying that you, as a wheelchair user, should benefit from the same safety standards as any other driver. It should be every driver’s right to be safe and comfortable. The Autoadapt 6-Way Base is crash tested according to global and European standards for vehicles. When seated at the wheel you use the vehicle’s original seat belt. The seatbelt receptacle in the 6-Way Base has been thoroughly tested including crash testing. We know that you – as a car owner – wish to keep the vehicle interior looking as neat as possible, despite any adaptation product installed. Our goal has been to design a 6-Way Base which blends well with the vehicle’s interior design. It is essential that a driver has stable seating, which doesn’t sway when making turns or wobble on rough roads. The construction of the Autoadapt 6-Way Base is designed to eliminate sway and to provide complete stability.